I've owned this car for nearly 10 years and am the 2nd owner. When I purchased it originally in '97 it had just a little over 5K miles. It now has just over 25K miles and as the mileage suggests, I average approximately 2K miles per year. (Independant Ferrari Services, John Tirrel - proporietor) and runs perfectly. It is an extremely clean car and looks great inside and out. The paint look excellent considering the age although there is some spidering. I have kept the car garaged always and it is driven almost exclusively during perfect weather. 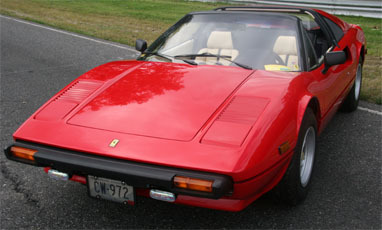 We show the car and have attended numerous concours events around New England. Most always when I enter the car it places routinely in the top 3. Over the years it has won Platimun, Gold, Silver or placed 1 & 2nd in its class. Brookline, MA and the Rolex/BMW Vintage Festival @ Limerock Park Raceway, Limerock, CT. The car comes complete with the original books and tools and I have complete service and ownership transfer history as well.